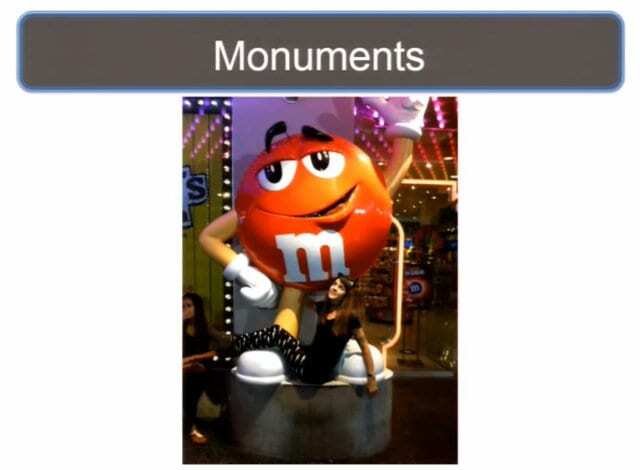 The closing part of Mr. Bransfield’s presentation highlights the key takeaways from his research and some extracurricular activities for the Defcon community. So, what have we learned overall? 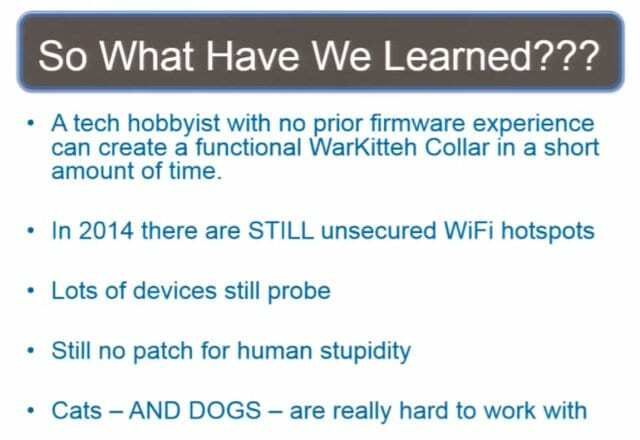 A tech hobbyist with no prior firmware experience can create a functional War Kitteh Collar in a relatively short amount of time. You can do this too. I didn’t know a damn thing about this stuff when I got started, and I got frustrated but I kept at it – and bam, I got some really cool stuff. 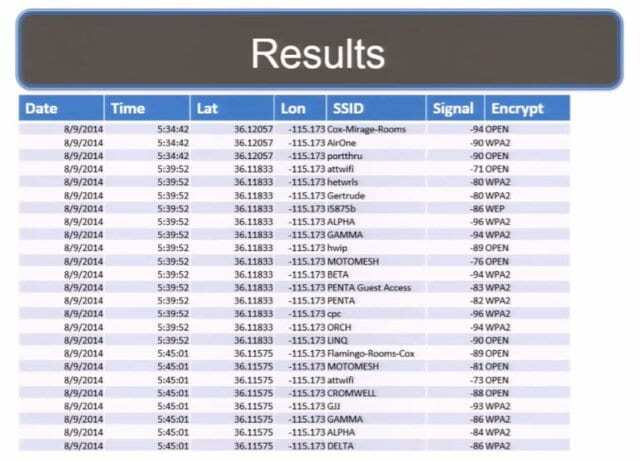 In 2014 there are still unsecured WiFi hotspots around. Lots of devices still probe for stuff. There’s still no patch for human stupidity. And cats – and dogs – are really hard to work with. 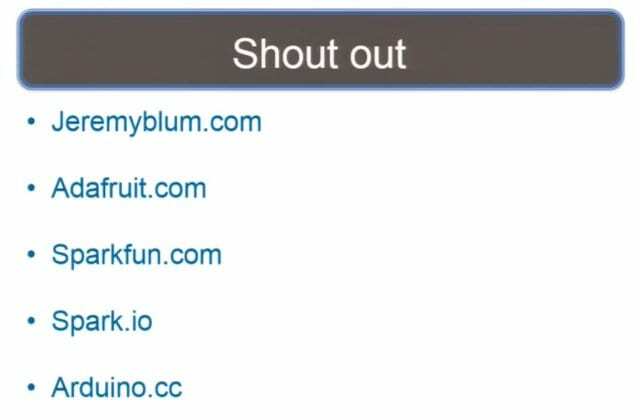 I’ve got to give a shout out to all these guys (see right-hand image). JK Devices – don’t go there, they are terrible. 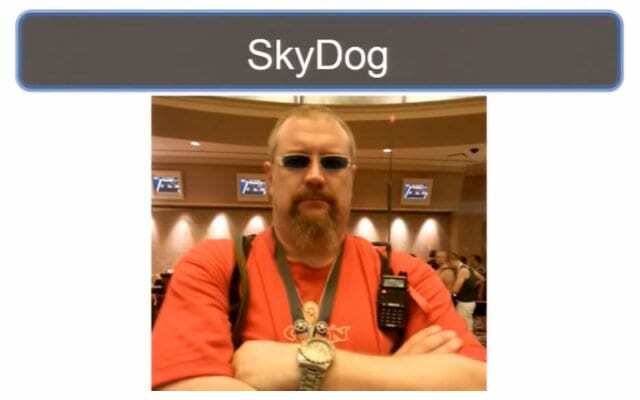 Thanks to Reeves, Bill, Joe, Joey, Nancy, Ricky, V-dog.owners, the Spark.io guys, the Nova Labs guys, V-dog, Skitzy, Coco, Tenacity, and of course Defcon. I’m so proud to be here! Everywhere I go with this community, you guys are willing to help. If you’re not a jerk you’ll be very accommodating and all that good stuff. You should be proud of this hacker community, and I’m proud to be associated with you guys. 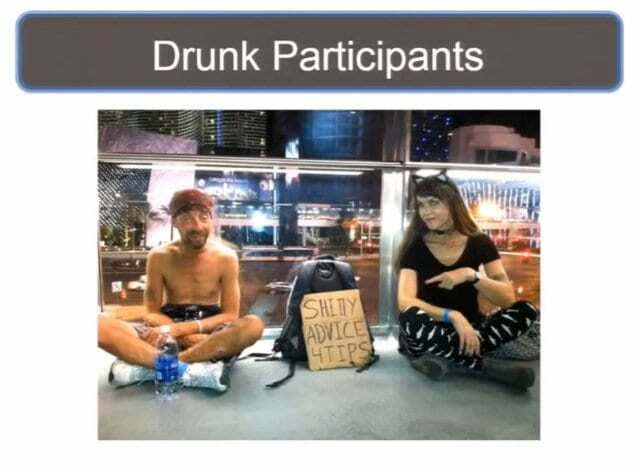 And because of that, I went out and did some extracurricular activities for Defcon with regard to the Denial of Service Dog and the War Kitteh. 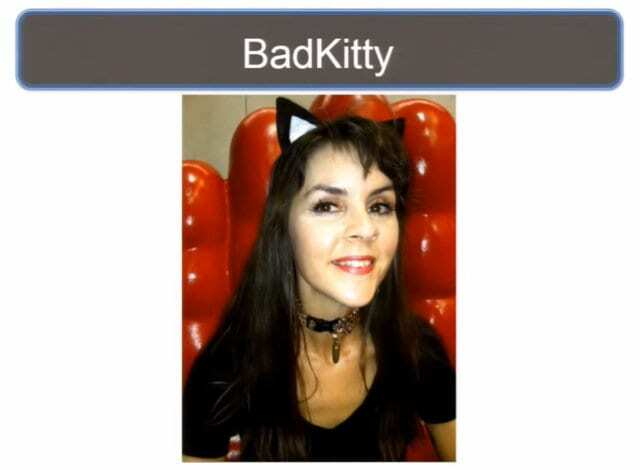 Defcon 22’s volunteer War Kitteh is the host of Hacker Jeopardy, Bad Kitty (see leftmost image above). She’s wearing the collar, folks! Look at her! We went up and down walking the Strip. There we are with a couple of girls (see middle image above); there we are with a couple more street performers (see rightmost image above); Zach Galifianakis guy showed up; we hit a couple of monuments and did all stuff (see leftmost image below); and we had a couple of really willing participants (middle image below); and a couple of not-so-willing participants (rightmost image below). 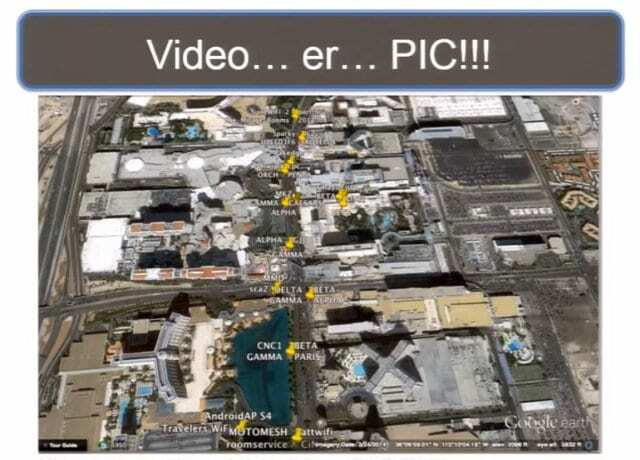 But here are the results from walking up and down Defcon, of walking up and down the Vegas Strip (see leftmost image below). And I couldn’t get the Kitty to work because of probably the demo fail, but that’s what we did just for you guys over the past couple of days. I got so much attention paid to me. I never expected all this. 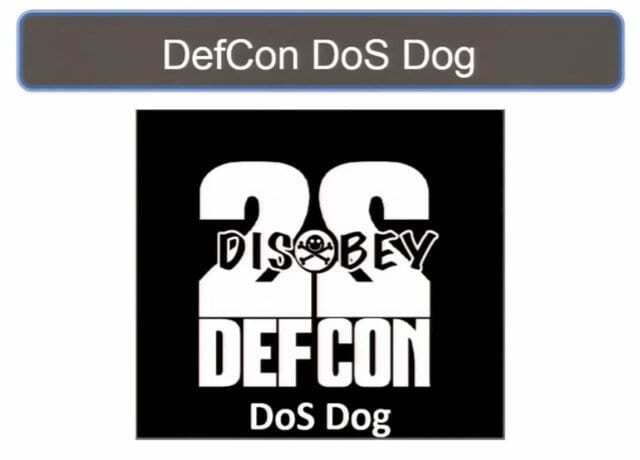 A lot of cool stuff, this is my best Defcon ever! But I got to leave you guys with this really hilarious funny thing that happened to me. 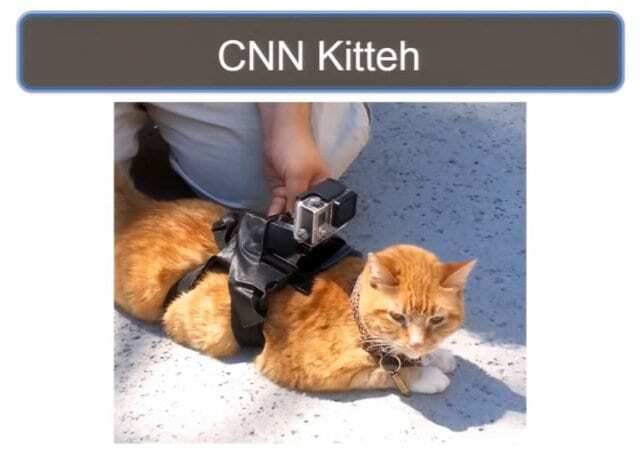 CNN did this to the War Kitteh (see right-hand image). They strapped a GoPro to his back, with tape. Yeah, exactly, and then they’re like: “Okay cat, get up and walk around, do this.” And the cat’s like: “No, I’m not going anywhere, screw you people!” So CNN found out what I had also desperately found out over this whole thing: cats are just damn hard to work with. Thank you guys very much!